fantastic show last night @ highline ballroom, glad to hear open letter and glamourboys for the first time in ages. 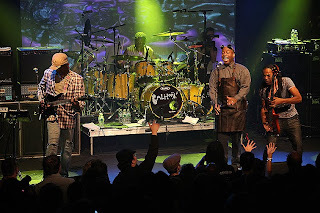 this is my sixth living colour show, im just pissed this is last date of tour, i could go for a seventh. Please PRETTY please can you Give Set-List of the OLDER songs like Funny Vibe or Memories cant wait were Played in NYC??? High-Line?? great energy from the band, loved Dougs teeth-playing the bass while in the crowd. You guys rock! keep it up, come back soon.